Last year, I get this call from The Baltimore Sun about doing a portrait of Oprah Winfrey for the front of their Sunday magazine. 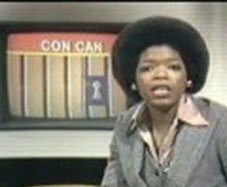 Oprah started out in Baltimore at WJZ-TV in 1976 and the article was going to cover the early years of her career. The art director sent along a couple of vintage photos that showed Oprah with an Afro and wearing some serious pantsuits with gigantic collars and lapels. 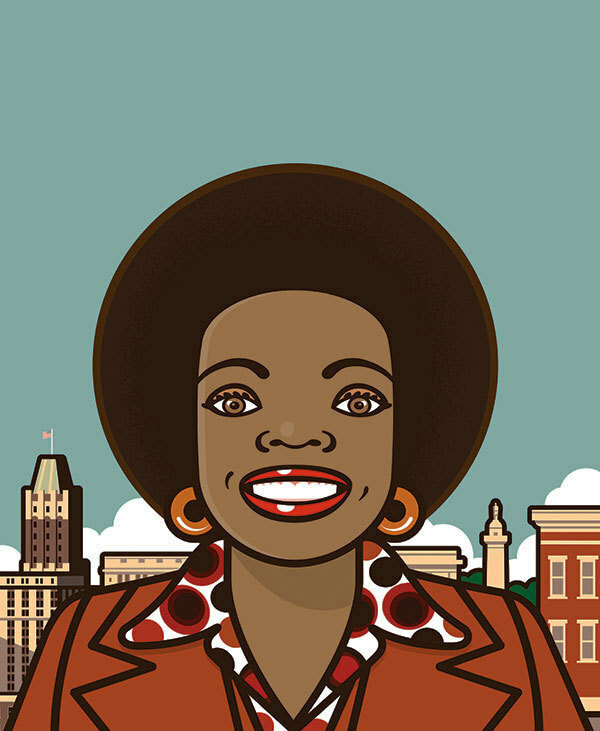 My idea was to do a piece that showed Oprah among some Baltimore architecture and give the whole thing a groovy 1970’s vibe. 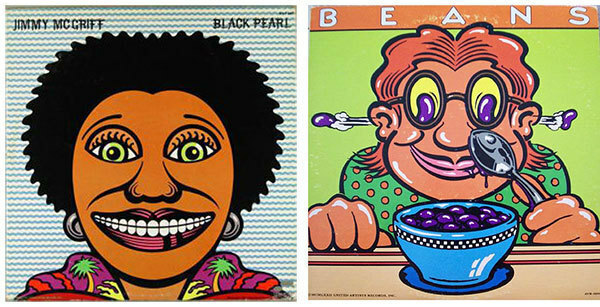 The main inspiration behind the style was some wonderful album covers I remember from that period by the great John Van Hammersveld. The sketch was approved and a few days later I delivered the final art. The art director liked it and sent it around for editorial approval. In about 15 minutes, he calls back with a story that someone in the office thinks the image is racist and has a “minstrel-y feel” to it. My reaction was to kill the illustration. If one person in the office was seeing the image like that I thought there might be many more in Charm City that would react in the same way when they saw the paper on Sunday, and that was the last thing I wanted to start up. I didn’t want a kill fee, I was leaving town in a couple of days so I had no time to make another piece and there was still time for them to get another illustrator to do a new portrait. I put the whole file in my back-up archives, and every now and then I’d take a fresh look at it to see if I got the racist vibe. It’s always tricky to see your own work through someone else’s eyes. A highly stylized portrait that retains a clear likeness is one of the hardest things for me to pull off. 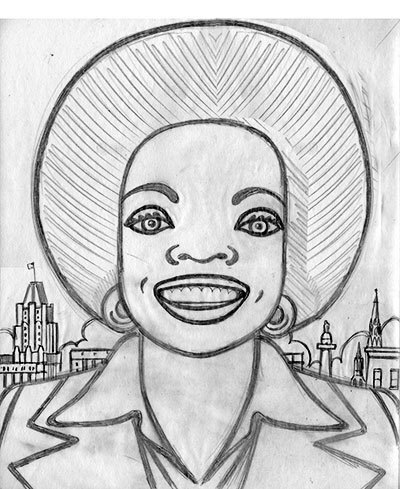 My goal was to make Oprah look beautiful and do it in that flat 1970s graphic style. The tale has a happy ending, the portrait was accepted into American Illustration 32, and I’d like to thank the members of the jury for giving this one a chance to see the light of day. Paul, I think it's a gorgeous piece. I was struck by your smart pop-graphic approach immediately. It definitely has the look of a young energetic Oprah. Love this, Paul. Not sure what to say about the "minstrelly" interpretation - I certainly don't see it, but I'm a white guy. A real eye catcher! It would be interesting to get a take on it from Oprah.. This is awesome Paul! The simplified shapes make this piece very attractive. The Afro reminds me of an LP from that time. Great piece. Paul, the piece is very well executed and professional like all your work. I don't see it as "minstrily". But when you get that kind of reaction it's difficult to move forward. I imagine the people at the Baltimore Sun are a bit sensitive to the race issue and I can certainly forgive them for being that way. I live here, it's still very very much a segregated city and predominantly African American. Race is always an issue, very much so in politics. BTW-love the skyline work in the background. For the life of me I can't see how someone could read a racist minstrel message in the image. It's a very arresting and simplified drawing/portrait with very smart color choices. Yes, very pop art-like. Thanks for sharing the back story and congrats on the piece getting recognized by AI.